A wind turbine changes the energy in the wind, called kinetic energy, into mechanical energy by way of a rotating mechanism. 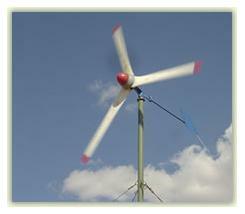 There are two main types of wind turbine and they are horizontal and vertical turbines. Although they differ in design, the way they produce electricity is basically the same. Horizontal wind power generators are the same sort of design as the old windmills that were used to grind wheat. They have propellers that are sent into a spinning action when they face into the wind. Vertical wind turbines actually spin on an axis with the ground being the center point. The whole system spins about the center point and is cylindrical in design. The wind blows against the blades of the wind turbine and creates friction. This friction causes the blades to turn or spin. The blades are connected to a shaft and by way of gearing, the shaft will turn a lot quicker than the blades and this is used to power an electric generator.